The crown reduction of a tree can be necessary for cosmetic and safety reasons. Crown reduction is one of the most popular techniques of tree pruning we use these days. The process involves cutting back the foliage of the outer part of the tree which in turn reduces the size and shape of the tree and turns it into a more manageable and appealing look. This can also help maintain the tree`s health by reducing the chances of some of the branches dying and falling off and decrease the chance of being infected by certain tree diseases. 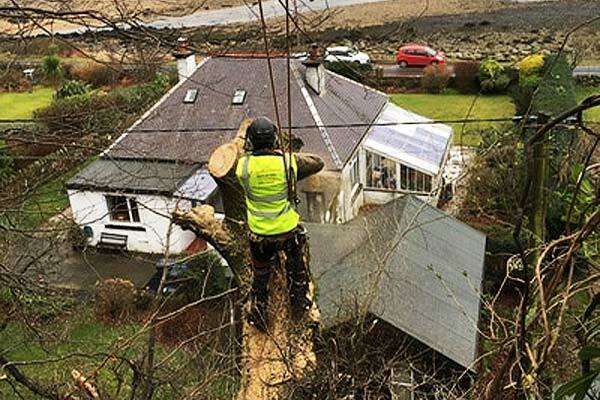 Also the overall weight of the tree is also reduced and this is especially useful when the weather is bad and stormy; the tree`s limb s are stronger and less likely to snap off and become a hazard to passers by below or any building in the vicinity. In our day to day business we need to help our clients with Crown Reduction for their trees and we can advise and suggest the amount and best procedure needed for the tree to keep it strong, healthy and looking at its best. We work with the local authorities on the best practice in tree management and cater for Tree Preservation Orders (TPO's) and trees in conservation areas and will carry out the work necessary within the guidelines given. We can also help out with the necessary paperwork that is needed for the local authorities to get the job done legally and properly. Tree Felling in Currie, Edinburgh! We had an interesting day out in Currie with some nesting pigeons who needed some peace and quiet. Under the Wildlife and Conservation Act 1981 it would be an offence to cut the tree down with nesting birds still living there. All birds and their eggs are protected by law and we always adhere to this! Therefore the pigeons and their offspring were given sometime to be a family and grew and we would wait until they had flown away and then we could finish the job we started. This can be one of the unexpected problems that can arise in the day to day life of a Tree Surgeon. "I needed advice on a rather over laden silver birch tree which was the cause of some problems with my neighbours. I contacted Special Branch and Stevie came that afternoon. He advised a crown reduction which he and Cameron carried out 2 days later. They were extremely professional but with the laughter and support that made a worrying situation much easier. Unfortunately, there was a pigeon nesting high in the tree and Stevie said, quite rightly, that he could not disturb the nest. They returned 3 weeks later after the birds had left to complete the job. I found them to be very skilful and knowledgeable about their work and would definitely recommend them to anyone." 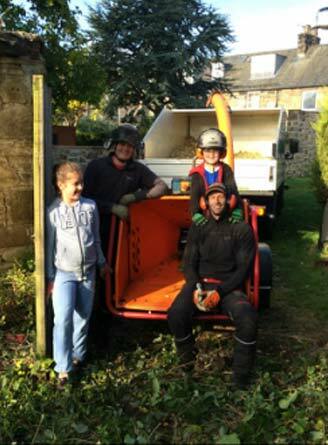 "Special Branch have helped us with our gardens and trees for over 8 years, involving a wide variety of work. In that time they've been completely reliable, honest and trustworthy as well as extremely hard workers who always approach their work in a professional manner." Trees as they age and grow can often get out of control if it is not maintained properly and then can be a hazard or even dangerous. They can often grow too large and can block out light due to their height or become too imposing in their size. 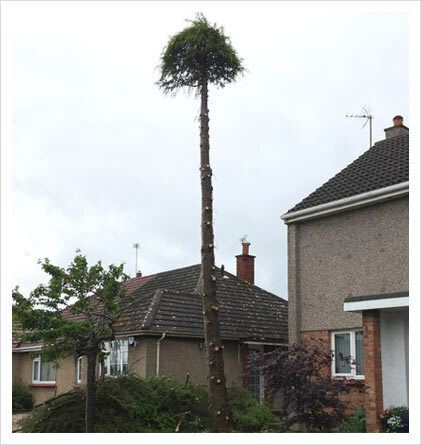 We at Special Branch Scotland can offer professional maintenance, pruning and tree crown reduction services which is done by experienced, qualified and well trained tree surgeons. 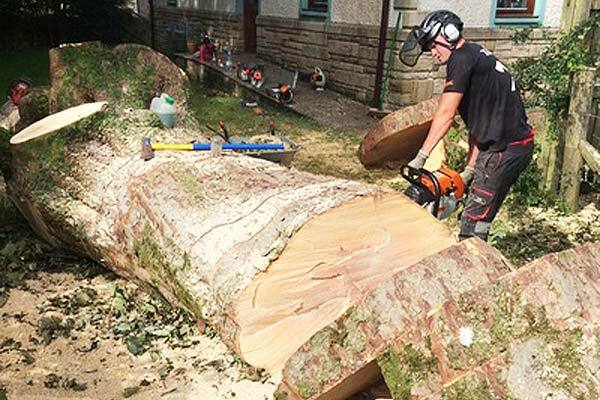 When you need a tree felled and removed then you can rely on our team of Tree Surgeons!